If real life were just like T.V., we’d all have shiny, healthy hair that looked perfect no matter what. Unfortunately, there are many hair problems that plague us. From thin hair to frizzy unmanageable hair, there are several common problems that people that prevent them from having perfect hairdos. If you’ve been struggling with your hair for years, there’s hope! There are some simple solutions to common hair problems that will minimize your hair’s weaknesses and emphasize its good looks. Problem #1: Thin, straight hair – Solution: For those with hair that refuses to hold volume, body or curl, the solution lies in the careful selection of hair care products, along with a few simple styling tips. Thin hair has trouble holding onto body, so look for hair care products that emphasize body and volume. Instead of using a conditioner each day, look for a lightweight conditioner to use every other day. This will keep your hair from being weighed down. Opt for mousse instead of gel when it comes to styling products, or avoid them all together. Blow drying your hair instead of letting it air dry will also help it build volume. You can also try Velcro rollers which provide body and volume, but not curl. Place the rollers near the root of your hair and then let your hair air dry. You’ll get the natural volume that you’ve been looking for. Problem #2: Dry, brittle hair – Solution: If you’re addicted to using heat to style your hair or you frequently use harsh chemicals (like when you color your hair), then you may be experiencing brittle hair that breaks and splits. You’ve got a lot of work to do when it comes to repairing your hair, but it is possible to rebuild the strength of your hair. First, you need to eliminate as many of the harsh products as possible and start using a deep conditioning treatment every other day for a week. After that, use a conditioner each day and avoid heated styling implements. Make sure to get regular trims so you can keep split ends out of your life for good. Problem #3: Frizzy hair – Solution: Curly and thick hair can get frizzy in no time flat if you don’t use the right products. Keeping hair shiny and smooth starts with your shampoo and conditioner. Try to find a product line that is specifically made for curly hair. These products have chemical formulas in them designed to smooth the hair shaft so you’ll experience less frizz. For curly headed people, conditioners are a must. If wash out conditioners haven’t been working for you, try a leave in conditioner that will continue to weigh down your curl throughout the day. Don’t forget to add a shine boosting styling product. This type of product gives your hair a bit of extra moisture along with ingredients to reduce frizzing. Fortunately, most hair problems can be solved with a few simple switches in your hair care products and your habits. It’s worth the effort to change the way you treat your hair, especially if you want it to be healthy and strong. When it comes to your hair, small changes can have a big impact. 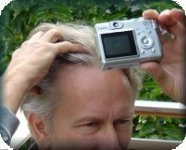 This entry was posted in General, Hair Damage, Hair Health, Hair Problems on June 10, 2008 by Larry Shapiro.